Brooklyn-born writer-director Noah Baumbach presented his sixth film in the last eight years, “The Meyerowitz Stories (New and Selected).” The film displays a side of New York that outsiders rarely get to see. It tells a series of stories about an ultra-liberal, effortlessly intellectual modern family who all seem unfulfilled with their lives as they navigate through awkward compromises and abrupt tragedy together. The film begins with Danny (Adam Sandler) attempting to parallel park in a crowded Manhattan neighborhood while his daughter Eliza (Grace Van Patten) continuously badgers him about his poor dietary choices. Their intimate bond is on display very early on as a familiar song comes on the radio and the stressfulness and difficulty of parking in the city disappear and the duo begin singing together affectionately. Upon parking, we’re introduced to Danny’s sister Jean (Elizabeth Marvel), stepmother Maureen (Emma Thompson) and his father, the patriarch of the family, Harold (Dustin Hoffman). Hoffman plays a retired sculptor and art professor who finds himself beginning to feel unappreciated and question his life’s work. The disappointment in his children’s lack of success or interest in a professional career in the arts is fortified by his own exaggerated views on his mediocre sculpting career. His wit and charm deflect his obvious flaws but he is certainly at fault for the pain and disconnection that is expressed toward him by the members of his family. In what feels like a second act, Baumbach introduces Matthew (Ben Stiller), Hoffman’s third child who is now a very successful financial manager in Los Angeles and has recently started his own company. Stiller’s relationship with his own son parallels how the Meyerowitz kids feel toward Harold as work has become the priority in Matthew’s life and family takes a backseat. 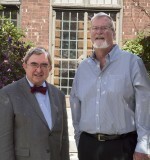 Matthew’s intentions appear to be unclear as he encourages his father to sell his Manhattan home and most of his assets, including his prized sculpture collection. An untreated injury eventually places Harold in the hospital which forces his three children and inebriated wife Maureen to come together and finish the planning of an art show in Harold’s honor. The relationships come to a bursting point as each son is meant to give a speech admiring their father, but end up relinquishing some negative emotions they have buried deep down within themselves. Baumbach seemingly attempts to end the movie on several occasions, but the story continues until Danny is finally able to assert his own desires instead of adhering to his father’s clinging requests. 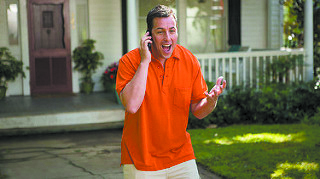 Sandler shows his range as he develops from his typical frustrated, yelling self to a loving, devoted father and finally as a person who now sees himself as his own man, rather than just his father’s son.